CLEAN, NEW world lay before Noah and his three sons when they stepped out of the ark. Now there were no wicked neighbors to mock at them when they built altars to worship God. Even the wicked works of those wicked people had been swept away out of sight. Everything was ready for a new beginning. Noah and his sons set to work and made new homes. Noah's sons were named Shem, Ham, and Japheth. After a while God gave them children. These children grew up and made homes for themselves. Then there were other children; and so it came about that the number of people grew and grew until the earth became as full of people as it was before the flood. "Let us build for ourselves a city," said the people some time after they reached Shinar, "and let us make a tower so great and high that its top will reach up to the sky. Then we shall not be scattered over the face of the earth, and separated from one another." And so the people set to work. Until this time all the people in the world spoke one language. Now God caused them to speak different languages. The people of one family could not understand what their neighbors were talking about. Neither could their neighbors understand what they were saying. Such a great change caused the people to become restless, and all those who spoke one language moved into neighbor-hoods by themselves. They could no longer go on with their great building, either, because the workmen could not understand one another's language; and so at last they quit trying to finish the tower whose top they had planned should reach the sky. 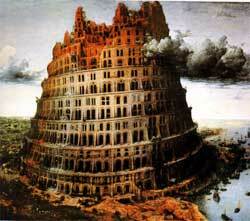 And the name of the city was called Babel. Soon the people of one language gathered together their possessions and moved away from Babel. Others did the same. Across the plains they journeyed and over the mountains into strange lands where men's feet had never walked before. They built cities and planted fields and vineyards, and their number grew until they became strong nations.